Introduced to Hollywood in the late '90s, RZA – Grammy-winning hip-hop MC/producer and co-founder of the Wu-Tang Clan – thought he would try something different when filmmaker Jim Jarmusch asked him to compose music for his new action-drama Ghost Dog: Way of the Samurai. It was not a gig he thought would lead to anything else. "At that point, I knew hip-hop was the wave I wanted to ride," RZA said during an interview about his new martial arts film The Man with the Iron Fists, in which he stars and makes his directorial debut. "I was dedicated to my music and knew it was my natural calling." When filmmaker Quentin Tarantino came to him a few years later requesting music for Kill Bill: Vol. 1, however, RZA was quickly drawn deeper into the moviemaking industry. "Somewhere in the middle of all that, I became part of the Hollywood circle," RZA said. "Now, here I am after years of good preparation, study and dedication, with a film of my own." 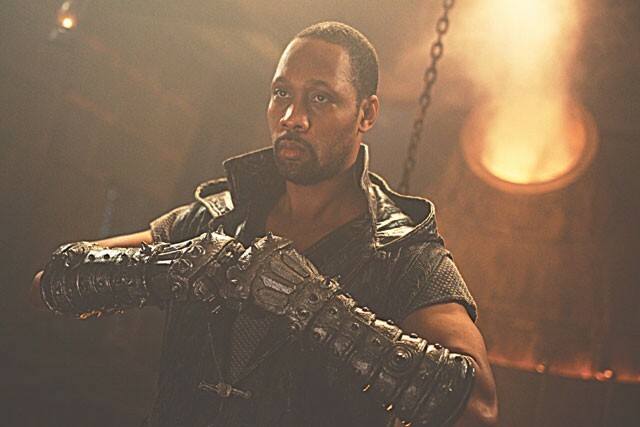 In Iron Fists, RZA plays a blacksmith in 19th century China who is forced to create a series of elaborate weapons so his village can defend themselves from a traitor hell-bent on destroying them. The film also stars Russell Crowe (Gladiator) and Lucy Liu (Kill Bill: Vol. 1). A long-time student of the martial-arts way of life, RZA admits his fascination for the genre started when he was a kid watching kung-fu movies. Over the years, it has evolved into something more meaningful. "Martial arts is all about sacrifice and loyalty," RZA said. "It's not about breaking rocks and hitting someone in the face. It's about defending yourself against ignorance. I'm proud to be that spiritually enlightened." Gaining full comprehension of his role as a director is exactly what RZA needed. He explains there were definitely "schizophrenic" moments during the Iron Fists shoot, but says he handled everything "like Capt. Kirk — calm and steady." "I was made to be a director," RZA said. "I had to worry about the art direction, costumes, makeup and hair, settings and locations, cameras and lenses, audio, lights. But I'm the type of guy who is able to think on multiple levels." RZA's responsibilities also included locking down music for the film. As the de facto leader of the Wu-Tang Clan, there was no way he was going to end production without getting a song from what Rolling Stone has called "the best rap group ever." "I already had songs from Kanye [West], Wiz Khalifa and the Black Keys, but I didn't feel fulfilled," RZA said. "I almost gave up, but in the last round, like the Wu-Tang always do, they showed up." RZA hopes they do the same next year when they celebrate their 20th anniversary with a possible new album and tour. "The tour will be for our fans, but it will also be for us as a group," RZA said. "We want to make it a great campaign and get together one last time before this chapter closes."